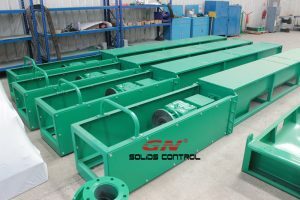 GN solids control shipped several units of drilling waste cuttings screw conveyor to Africa Client, this is repeat orders for the same clients for many years. The screw conveyor is widely used for transferring and collecting the drilling waste cuttings from solids control system. 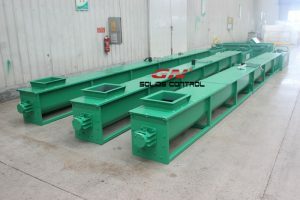 The screw conveyor might be installed on different place for different functions, for example, it can be installed along with the solids control system mud tank besides the shale shaker, mud cleaner, decanter centrifuge to collect the discharged drilling cuttings; it can be installed slantly under the horizontal installed screw conveyor to transfer the drilling cuttings to vertical cuttings dryer; it could be installed under the vertical cuttings dryer solids discharge port to transfer the discharged solids cake outside automatically, it can be installed under the decanter centrifuge solids discharge port to transfer out the solids automatically. It can be used in cuttings solidification unit to transfer the 3 materials and mix them together. The screw conveyor can transfer the material with less fluids content in the cuttings, otherwise it will flow back and spill out. When the fluids content is very high, we need to use vacuum pump, slurry pump or hose pump to transfer to the drilling waste management system. 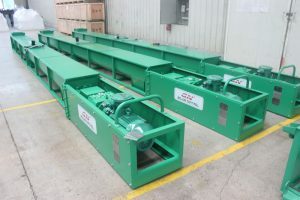 The screw conveyor with top cover to avoid the spilling out of the waste, the length is optional, each section is 12ft, you can choose 2 section, 3 section, 4 sections, if you need it to be longer, you can use several units together. The screw diameter is optional for 10 inch, 12 inch, 14 inch, 16 inch, 18 inch based on different transferring capacity required. The solids discharge port could be one or two based on the actual requirement. If you need a customized drilling cuttings transferring system, pls contact with GN solids control.